The other question that people ask me quite often is..."What's your favorite chocolate in the whole store?" I'd like to state that over the years I've tried every single thing in this place (it's called job research...hello!) but I always seem to go towards the same two things: milk chocolate pecan slowpokes and pecan caramel truffles. The traditional "turtle" is pecans, caramel, and chocolate...but here at Betsy Ann we call them slowpokes. Clever, huh? And let me tell you....if you've never had a Betsy Ann truffle in your life...you.are.missing.out. Simply. Amazing. You.Get.The.Point. So I can stop.typing.like.this. So my mission was to translate my favorite chocolate candy into a cookie and the result was INSANELY yummy! I found these at Target...perfect! 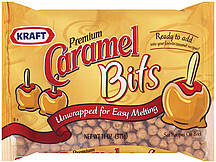 caramel bits! No unwrapping needed! Here are my caramel chocolate pecan cookies! And guess what....I'm sharing the recipe with you...just scroll down! Using your mixer, cream the margarine and sugars until fluffy and then add in the egg and vanilla. Beat on medium until well-mixed. In a separate bowl combine the flour, baking soda, and salt. Add the dry mixture to the margarine mixture and mix well. Mix in the caramels, chocolate chips and pecans with a wooden spoon and stir until combined. Drop the dough in rounded tablespoons onto the cookie sheets. Bake for approximately 11 minutes(I use dark cookie sheets so depending on which kind you use the baking time may vary) until the cookies just start to brown. Allow them to continue to bake on the warm cookie sheets for 5-7 minutes and then transfer to a cooling rack. Try to keep from eating a really hot cookie because the caramel WILL burn your mouth (Obviously I'm speaking from experience...ouch!). Store cooled cookies in an air-tight container and they will remain soft and chewy! Enjoy!